Widely regarded as the finest poet of his generation, Seamus Heaney is the subject of numerous critical studies; but no book-length portrait has appeared until now. Through his own lively and eloquent reminiscences, Stepping Stones retraces the poet's steps from his early works, through to his receipt of the 1995 Nobel Prize for Literature and his post-Nobel life. It is supplemented with a large number of photographs, many from the Heaney family album and published here for the first time. In response to firm but subtle questioning from Dennis O'Driscoll, Seamus Heaney sheds a personal light on his work (poems, essays, translations, plays) and on the artistic and ethical challenges he faced, providing an original, diverting and absorbing store of reflections, opinions and recollections. The world just lost one of its most thoughtful poets when Seamus Heaney died just a couple of weeks ago. I received this collection of his interviews with Dennis O'Driscoll about the same time, so reading it was especially poignant. I appreciated the depth of Heaney's answers to O'Driscoll's probing questions, all very literary and quite thorough. Because I am writing a paper on the poetry of the IRA hunger striker, Bobby Sands, I wanted to compare his background and work to that of Ireland most famous literary son since W. B. Yeats. I found there was little to compare. 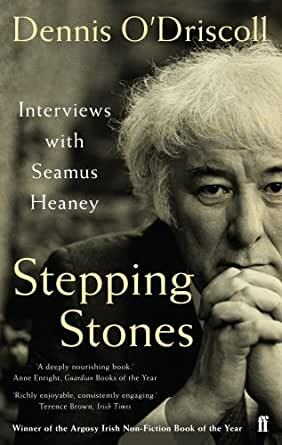 Heaney's upbringing was largely protected and privileged, his path toward success directed early in his life via private schools and university education, meeting and befriending the intelligentsia of his day; his Nobel Laureate practically a shoe-in. Sands had no privileges, only obstacles, and though his poetry does not begin to measure up to Heaney's in form or depth, the conditions under which he was forced to write and the passion that fueled his cause made concrete through his pen puts anything Heaney did to shame. Heaney admits he could have taken up the cause for Ireland's freedom, as did Sands, but he preferred a life cloistered from chaos--and sacrifice. While Heaney's work will live on for its poetic perfection, perhaps, Sands dedication to freedom and peace in Northern Ireland will be the greater and more lasting contribution. I happened to be writing a paper on Seamus Heaney, the contemporary Irish poet, for my literary club. There is no official "biography" as such but this is better! It's a series of questions and answers put to Mr. Heaney by Dennis O'Driscoll, a very talented writer in his own right. It is anything but dry, as so many biographies are. I really feel that I "know" Mr. Heaney now. Mr. O'Driscoll is a skilled interviewer and asks questions I never would have thought of. The book is fairly long and took several years to write but is so interesting that it's a fast read. I really really liked this book! Love this wonderful essay book! 5.0 out of 5 starsSeamus Heaney was a genius. EXCELLENT QUESTIONS BY THE INTERVIEWER. I learned so much about the poet, Ireland in the 40's and 50's and what made this poet so special. Best book I have read in years!!!!!! !